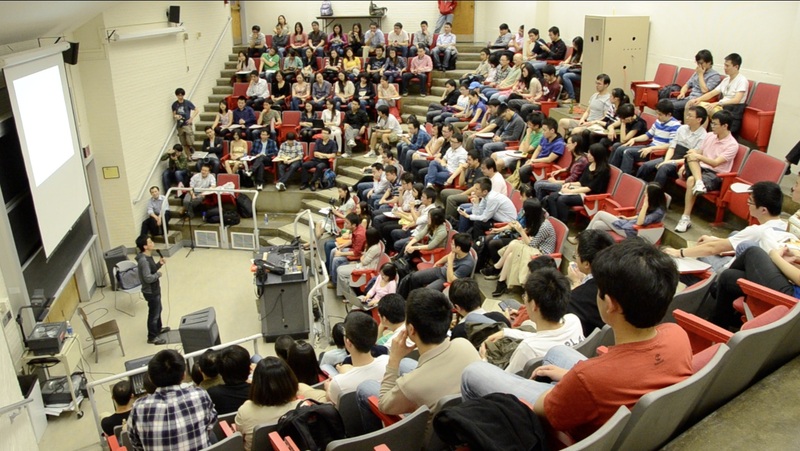 In the afternoon of March 25, MIT Chinese Student and Scholar Association (CSSA) Career Development team hosted a special lecture, titled “From chemistry engineer to comedian – a dialogue with Joe Wong” at classroom 35-225 at MIT. Well-known Chinese American comedian Joe Wong shared his experience from a chemistry engineer to a stand-up comedian with over 100 attendees. Born in the Northeastern part of China where many most-popular Chinese comedians such as Zhao Benshan and Xiao Shenyang came from, Joe Wong is a Chinese American Comedian and chemistry engineer. He headlined the Radio and TV Correspondents’ Dinner in March 2010 where he roasted vice president Joe Biden. He made multiple appearances on David Letterman’s Late Show on CBS and the Ellen Degeneres show. Wen Sang, a mechanical engineering student at MIT and co-chair of Career Development of MIT CSSA wrote in his email to reporter: “We are very lucky to have Joe Wong sharing his interesting personal stories, experiences, feelings and thoughts with us. Joe’s story showed that everything is possible in your career if you put effort into it.” Mostly Chinese students from MIT, Harvard University, Boston College, Boston University and Northeastern University attended the lecture. During the lecture, Joe Wong reflected on his own experience on career development. He mentioned that it might take someone 15 years to find out what career path he or she could really excel in. The key is never to give up your dream, and keep trying. He spent years in Boston’s night clubs and countless hours at home to polish his comedy routines. Joe Wong moved to Boston 10 years ago. He worked at a pharmaceutical company in Cambridge, and is a member of the Sino American Pharmaceutical Professionals Association(SAPA). Of course, Joe Wong delivered a few jokes in Chinese, and the classroom was full of laughters.